Residential Landscape and Environmental Design — We’re interested in projects ranging from research based help with ideation and affordable creative direction to comprehensive master planning and construction management. Our experience has taught us that balancing the poetic with the constraints of budget, site and building is an art form. Cultural Institutions — Environments that are sensitive to the spirit of art and its life, both in and outside a museum or gallery, are of great interest to us. We’re positioned to lead the conceptualization of projects in collaboration with architects, planners, engineers, ecologists, and curatorial staff. Public Art and Pavilions — Project specific work that’s informed by a sense of community and the exploration of a public growth. Space can facilitate openness as a platform for dynamic shared experience that becomes an opportunity for a style of inquiry and learning that isn’t prescribed, but is meant to be lived. The initials I\E\E come from “Int.Est.Ext.”—the abbreviation for “interior establishing exterior”—used by screenwriters to communicate with directors and cinematographers about the soul or essence of a scene or shot. The name is a fun, spiritually lighthearted attempt to point towards poetic questions about space, both in the way we experience it and in the way it shapes and effects us. Some indigenous peoples have held a more literal belief that what you see in the moment IS you… not that you’re a separate being entering a space, encountering separate things, but that the space IS you. This excites us because it presents a possibility of an expanded understanding of how fundamentally important the choices we make about the space we spend our time in are. The “garden” has long been used as a metaphor when we talk about human growth and meaning. There’s a story we love about DT Suzuki, the scholar who is often credited with having brought Zen to the West by translating many important texts into English for the first time. In 1953, he was invited to address the World Council on Faith in London. The group’s members were very excited to hear about Zen as there was very little information available at that point. He took the stage to a packed house. “I cannot explain Zen to you” he began “but I want to tell you about my garden, which I love.” He proceeded to share, in detail, about his simple Japanese garden for an hour with a deep spiritual genuineness… he received a standing ovation. His openness and gentle but absolute focus was a great influence on some of our heroes like composer John Cage, poet Allen Ginsberg and philosopher Alan Watts, to name a few, and we think of this often as a guiding principle in our work and attitude towards it. But we’re not just excited about the poetic and spiritual aspects of the landscape but also the emerging science around plant intelligence and the field of plant neurobiology. The fusion of historical and modern research seems to be pointing us toward. This might all sound high minded—and it is in an aspirational sense—so it’s important for us to attach it to a gentle humility that’s based in the ground as well. Simplicity comes after complexity, not before it. The democratic attitude of early modern design practitioners like the Eames Office and Marcel Breuer is also deeply important to us. They were informed by a streak of optimism in the future based on a new approach to living involving technology and emerging production processes; they believed good design and aesthetics made your life better and wanted to make that available to the masses. We’re inspired by this sensibility and see its presence today in a growing generalized public interest in ecology, meditation and mindfulness, contemporary art, and a longing for a deeper awareness. We hope you can tell, we love our work. If you have any questions at all or are exploring a project, please be in touch. We’d love to tell you more about our process and approach. Matt Olson works on a wide array of multi-disciplinary art and design related projects. He’s also an active teacher and frequent public speaker who loves the workshop as a medium for exchange and growth in a truly collaborative space. He was the cofounder and creative director of RO/LU from 2003 to 2015 during which time he oversaw work ranging from residential landscape design (in the photos shown here) and sculptural furniture projects to museum residencies and publishing. That studio’s work has been shown internationally and is in the permanent collection at the Walker Art Center as well as many esteemed private collections. He was a 2013 artist-in-residence at the Robert Rauschenberg Foundation and was, along side many of his favorite designers, architects and artists, included in the book form compendium of interviews from PIN-UP Magazine (link). He’s been a visiting artist/scholar/speaker at SAIC (School of the Art Institute Chicago), SCAD (Savanah College of Art & Design), UIC (University of Illinois Chicago), the Cranbrook Academy of Art, SCI-Arc (Southern California Institute of Architecture) and he currently teaches in the School of Architecture’s BDA program at the University of Minnesota. I\E\E provides residential design services for projects of all sizes and most budgets. From a small postage stamp backyard in Brooklyn to a multiple-acre wooded lot outside Minneapolis, Chicago or Portland, we can develop the right design based on a client’s budget and goals. Contrary to many peoples intuitive ideas about how design works, the creative process and ideation is generally the easy and fun part, while making something that is deliverable within a defined budget and complex site ecology is the real work. Understanding and shaping the constraints from both practical and poetic perspectives is what makes a great design. The language of space can be elusive and is always changing. The vernacular we use to discuss it—words like texture, balance, repetition, rhythm etc.—can be used to describe music, poetry or painting as well and we see this inherent connectivity as a very exciting thing. We believe in the power of simplicity and understand that it comes after complexity, not before it. The ability to deliver work that is within scope according to budget and the functional physical realities of a site isn’t generally thought of as an art form but, we firmly believe it is. And while it’s less glamorous in ways than the visual and experiential evidence at the end of a job, often it is this component that makes or breaks a set of ideas and their potential to come to life. Only experience can teach someone to understand this part of a job and we embrace it wholly. For 15 years we’ve been deepening our knowledge of this very important aspect of the job and we’ve come to love and trust it as a guiding principle. It’s amazing how often the limits of a situation are what brings the best out of the work. We are affiliated with builders and fabricators who share our beliefs and commitment to quality and details. I\E\E is available to offer consulting and oversight during the often complicated construction process. We know that realities emerge during the build that often require real-time decisions that can affect the outcome of a design. We are deeply committed to using only native species and plants that do not contain neonicotinoids. We love the pollinators and the role they play in our beautiful ecosystem so we feel it’s extremely important to defend them. We have been outspoken within our profession and are active politically to encourage trade groups and large suppliers to abide by strict environmental guidelines. We support using small greenhouses and suppliers. I\E\E has a profound interest in and love for contemporary art and the museums and galleries that host it. The site around these buildings is a special and important opportunity to extend a “place” of poetry and expansiveness. A platform to further the experience a visitor has. Because of our involvement with art, we’re specially positioned to lead the conceptualization of projects around these buildings and sculpture gardens. We work well in collaboration with architects, planners, engineers, ecologists, and curators. And we think cultural institutions deserve their own line of thinking. As the profession of Landscape Architecture is becoming almost synonymous with Urban Planning, driven by large municipal or corporate projects and their attendant goals—understandably—its focus has turned more toward science and sociology, while aesthetics and poetry are often a later consideration. When I\E\E founder Matt Olson was invited to do the PIN-UP Magazine Interview, they asked him to pick a place in the world that he loved and would like to talk in. He chose the garden at Noguchi Museum in New York. A space that is illustrative of the poetic sensibility that can reach past our language’s desire for specifics and answers; a place that can make the notion of disciplines in the arts become blurry; where the distinction between interior and exterior becomes impossible… one can’t help but behave in a manner that is based in responsive openness and earnest seriousness. In 2012, I\E\E founder Matt Olson worked on two projects that happened in, and with, the public that were completely transformative. Encountering what he describes as “an unfolding”… a type of work emerged that was unpredictable, filled with learning and deeply collaborative with its audience. “Here There, There Here” was a collaborative project with LA based architect Laurel Broughton and her studio WelcomeProjects. It was part of the High Desert Test Sites ‘happening’ that artist Andrea Zittel programs every year at her A-Z West compound in Joshua Tree CA. 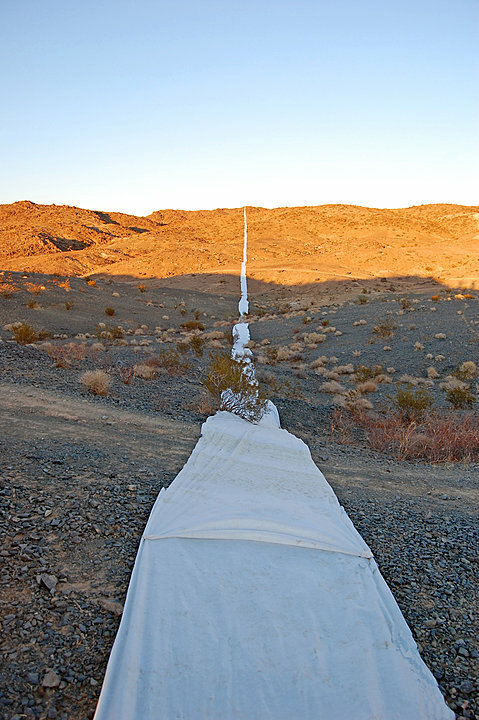 A 2 mile long by 5ft wide straight line made of white felt traveled through the desert and over a few small mountain ranges. The public was, of course, very aware of this giant piece and the amount of conversation it created was almost unbelievable. One of the insights involved the public and their open and willing embrace of the project while it was being built, contrasted with a nervous, stand-offishness when the work was done and was being presented as art. Certain ideas about when a piece of work is “alive” and best positioned to engage people started to emerge. And as the Open Field Artist-In-Residence at the Walker Art Center in Minneapolis, more experience with this conversation as a platform for exchange in the art context came to life. The exploration of when people are comfortable with the vulnerability of embracing a not-knowing and when the intimidating nature of the institution is too strong. (this is not a complete sentence,but not sure how to fix it — maybe OK as is—) This project was discussed in a TED talk for its innovative placement of challenging contemporary art in the non-art specialist context. We’re interested in work that continues to follow forward these explorations… work that lands in-between things… living a life of its own, a life that can be trusted to cross disciplines, demographics and contexts creating outcomes that are far better than a planned strategy could foresee.